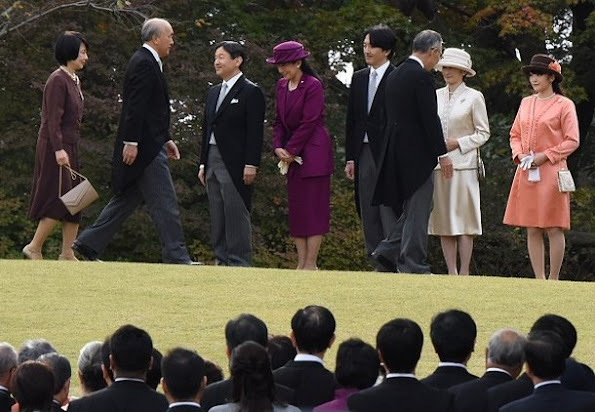 Japanese Crown Prince Naruhito and Crown Princess Masako, Prince Akishino, Princess Kiko and Princess Mako attend the annual autumn garden party hosted by Japanese Emperor Akihito and Empress Michiko at the Akasaka Palace imperial garden in Tokyo on November 12, 2015. Garden parties hosted by the emperor and empress are held twice a year, in spring and in autumn. 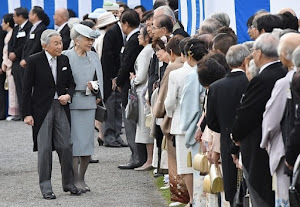 Crown Princess Masako took part in the garden party for the first time since the autumn party in 2003. 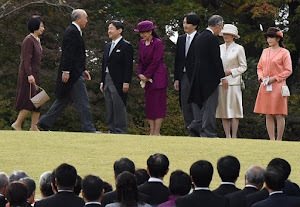 Nice to see Princess Masako again. The crown prince is really looking a lot like his father, impressive! The Empress is absolutely lovely. I have to say that though I understand that there is a strict dress code for these events all the princesses look very frumpy. The empress is the only one who is chic. She never fails. Regal family. the older Monarchs (EU as well) all dress so dignified and beautiful.